In central Italy on the Adriatic side is a quiet region with a lot less notoriety than its neighbors. Comprised mostly of hilly and mountainous terrain with a narrow stretch of pristine coastline Le Marche is an unassuming paradise. Refreshing sea breezes and cooling air from mountains and lakes contribute to an ideal mediterranean climate for grapevines. 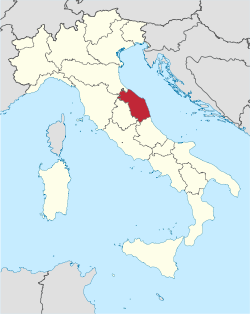 This land is the birthplace of the verdicchio variety. A wine historically given to soldiers by the barrel to maintain strength while battling Romans. It takes several forms in this diverse area where styles can be crisp and easy or complex and mineral rich. Verdicchio, named from its green (verde) tinged berries, is of few Italian white varieties built for longevity. When cultivated and vinified with care they can evolve in bottle for over 10 years. In addition to this noble white it’s also known for some serious production of Montepulciano and Sangiovese on the sunny foothills of Ancona. Here Conero wine is made, which is the only red DOCG in the entire region. Grown in mineral rich chalk and clay soil these are muscular wines of distinction.